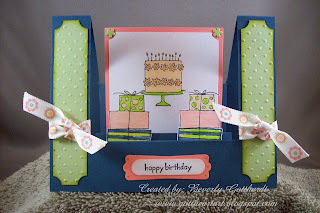 Melissa at Tuesday Morning Sketches gave us a link to Dawn Griffiths YouTube instructions for this card. I think Dawn may be the Queen of YouTube instructions. I've been looking at her blog and her instructions even before I had a blog. Clear, concise, and she's always got a smile in her voice. I believe I CASed her step ladder card. I changed the image and colors, but the ticket punch and the modern label punch seemed perfect for this card. This scrap of ribbon has been laying on my work table for a while now begging to be used because it's the last of it's kind here at Gottheart Art, again a perfect match for this card. Supplies: Papers: Stampin Up-Not Quite Navy, Cameo Coral, Certainly Celery, Whisper White, Stamps: Stampin Up-Happy Moments, Itty Bitty Backgrounds, Ink: Ranger Archival Ink-Jet Black, Stampin Up-Pink Pirouette, Kiwi Kiss, CTMH markers, Spica Glitter pens, Cuttlebug embossing folder-Swiss Dots, Stampin Up punches-ticket punch, Word Window, Moder Label, small flower brads unknown, ribbon-Am Crafts, pop dots. I really do like your step ladder card! What a great way to use the colors too! Thanks so much for playing along with us at the Color Throwdown! Great card Beverly! Thanks for sharing it with us at Tuesday Morning Sketches.